No matter what your profession is, this sit stand workstation will allow you to create a comfortable and productive workspace. The OFM Adjustable Sit Stand Workstation allows you to create a more ergonomic and flexible workspace, with the desk you already have. The workstation clamps right onto any table or desk, allowing you to enjoy an adjustable work surface, which easily moves from sitting to standing, and back again, at any time. With this kind of adaptability, finding a comfortable and healthy position is very easy. This stand up workstation has lots of convenient features. A built-in keyboard tray adjusts with the work surface height, so you can get an ideal typing position from any height. A groove supports a tablet or smartphone. 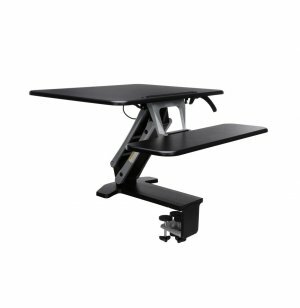 No matter what height you choose to work at, this sit stand workstation will provide sturdy and reliable support throughout the workday. Versatile: The workstation clamps easily onto the surface of your current table or desk. Technological: A groove allows simple positioning for a smartphone or tablet. 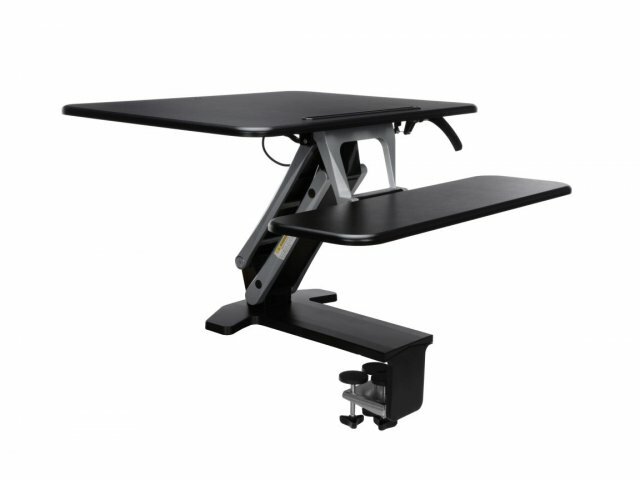 Ergonomic: Height adjusts from 6.5-16.75" above your table or desk, via hydraulic-assisted lift handles, allowing for customized positioning. Sturdy Design: The work surface remains stable at all heights, even fully extended. Healthy Typing: Built-in keyboard tray facilitates proper positioning for typing.